People have chosen their computer of choice; it's the smart phone. * Smart phones are ubiquitous around the world. This means that we need to be able to get medical information on smart phones in a way that it can be easily understood. We need Treatment Scores, which represent the net treatment benefit for patients treated in the past. Imagine being a physician, nurse, or allied health care provider and having Treatment Scores figured out for every treatment that is important to your medical practice. 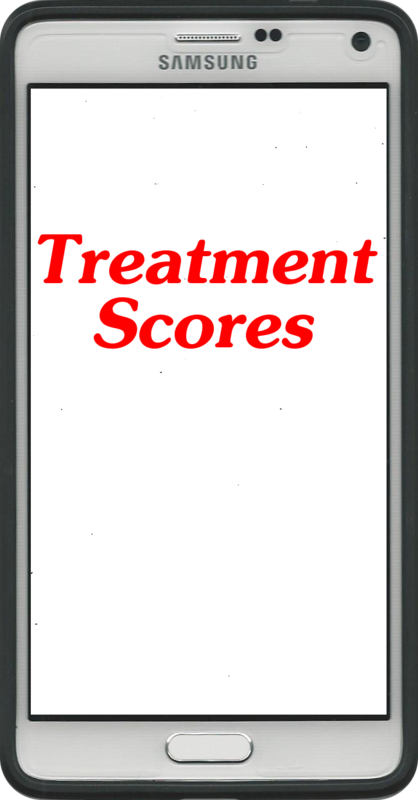 Such Treatment Scores, created using the tools at TreatmentScores.com, might be based on guidelines already on the web site, or using evidence-based medicine guidelines as determined by you, your journal club, or other experts. Having Treatment Scores would save time. And, if Treatment Scores are transparent, they would be a huge step forward in teaching the World how evidence-based medicine works. Such a system would finally make shared decision-making possible. Treatment Scores would also save money. Let's say a physician is with a patient and he or she pulls up their "homework," which is their own review of the medical literature for 130 different treatments for insomnia on their cell phone. The physician may show the treatments to the patient, because the patient wants to learn. On the right it says "not scored." The problem is that no "weight" has been given for the "side effect" on the right of having to go to group therapy for 90 minutes per day, six days per week for six weeks! (Which is one of the schedules for cognitive behavioral therapy in a study supporting it as a treatment for insomnia.) The patient appears horrified. You ask for their input. They say, "That reduces the Treatment Score to nearly zero for me. I don't have 90 minutes per day for six weeks to go to group therapy! I have a job, kids, family...." You say, "Okay let's reduce the Treatment Score for cognitive behavioral therapy down to almost zero based upon your input." A different patient may be exactly the opposite. They may love the idea of going to cognitive behavioral therapy for 90 minutes a day. They may have the time and the inclination, and may not want to take any medications if they can avoid them. This is why patient input as part of shared decision-making is so important. But for now, let's look at this patients preferences incorporated into the decision-making process. We are looking at the remaining three treatments to discuss with the patient. 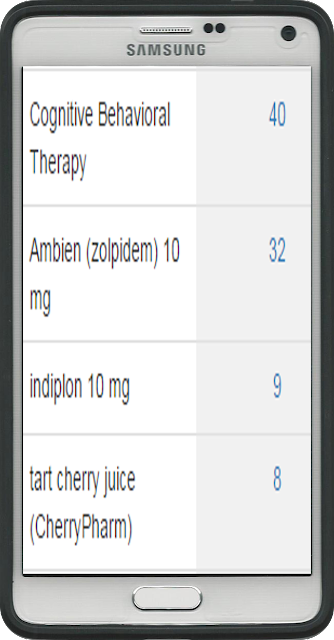 The patient and physician can discuss the pros and cons of these three treatments and can look at the Treatment Score Calculator™ behind each one. Or, you can pull up other treatments from your list of 130 treatments for insomnia. This is why we need a system that allows patient input. In this example the patient had some input into the review of the treatments. The patient was able to let the doctor know that the time that would be needed for therapy sessions was a huge negative for them. It becomes extremely vital to know the Treatment Grades when the outcome measure is something like overall survival. People with cancer often have no idea if the treatments being offered to them are grade A (the highest), or grade C (average), or grade E (the lowest of the positive grades for treatments) using this system. This is why we need to be able to organize the data more in line with what the patient needs regarding the diagnosis important to them. For insomnia, is the diagnosis predominately difficulty falling asleep, staying asleep, quality of sleep, or all of those? And when we give the net treatment benefit for patients from past medical studies, we need to show the statistics and get the patient's preferences for how the side effects may be weighted. Can it be done? Yes. Sabermetrics are used to reduce what is important in baseball down to one number. 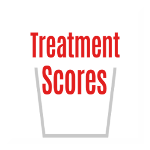 Treatment Scores can be used to reduce what is important in medicine down to one number. We call it the net treatment benefit, or the net absolute treatment benefit (for the patients studied in the medical literature in the past). "You‘ve got to start with the customer experience and work back toward the technology - not the other way around." - Steve Jobs. 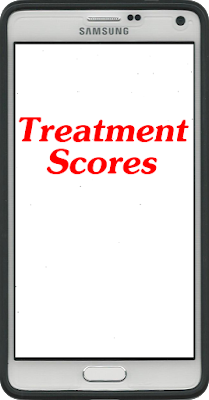 What this means is that the front end of Treatment Scores needs to be very simple, fast, and understandable. The back end can be full of statistics (ranges, confidence intervals, standard deviations, statistical power, p values, number needed to treat, ratio of means, relative risk, and so on). The front end can also be customized for the casual user versus the advanced user. Do We understand Treatments Now? No. In a study of 531 physicians, "Do clinicians understand the size of treatment effects? A randomized survey across eight countries," by Bradley C. Johnston, PhD, et al. They found that over 80% of physicians could not correctly figure out the treatment effects that were reported as "mean difference in natural units" or as "standardized mean difference." This is just one example of all the confusion! I think one can reasonably assume that if physicians don't understand treatments, then patients don't understand treatments. See the disclaimers below. *Someone made a similar statement before me about cell phones being so dominant, but using Google I was unable to find the original source.